Dickson and I are taking it back to the old school on Saturday at 9 a.m. with a traditional shop run. No big deal -- ten miles or so. Remember that because of remodeling the Georgetown store is operating from a temporary location about 20 feet from the usual spot (3401 M) (at the foot of the Key Bridge, seen here). Post up or email if you're interested. April is almost upon us, which means its time for baseball (The National Pastime) and outdoor track (The Other-Other-Other-...Other National Pastime)! For the women and men of GRC's track squad, that means its off to either NC State's Raleigh Relays or UMD's Maryland Invitational, where spring weather and springier legs should lead to some fast early-season times. In addition, a small crew will take to the roads of the Commonwealth at Richmond's Monument Ave. 10k and Ashburn's Van Metre Five Miler. The action begins bright and early Friday morning in Raleigh with Susan, Tina, Matt "Fridge" Hasset and Texas Paul in the 5k. Then, after an afternoon seventh-inning stretch, Heather takes on a crowded field in the 1500 and Beth makes her yearly pilgrimage to the track for another fast 5k under the lights. After a string of exciting performances on the roads, Coach Jerry is excited for Beth to work on some speed and thinks "she's ready to make a major breakthrough at 5000." 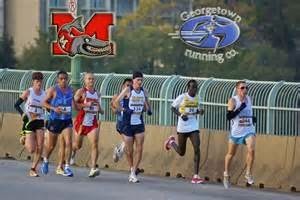 Back in my beloved Old Line State on Saturday, a slew of GRC harriers will line up at UMD's Kehoe Track for the Maryland Invite. Though normally a low-key affair, this year's event showcases a few of GRC's best and brightest in their return to the outdoor oval. Coming off an 11 month injury hiatus, Hilary May is back on the track in a 1500 for the first time since her spree of club records in 2012-13. Coach Jerry is excited for the future, noting that "Hilary rewrote the GRC record book on the track last year, and after a long battle with injuries, she is ready to race her way back into shape." Avril joins her teammate in the metric-mile, making the event a must-see for GRC middle distance fans. On the men's side, Mike F, Witty and JR will get things started in the 5k, before Chuck "Big City" Kacsur toes the line for a two-lap race to be named later. The 5k marks Witty's first 12.5-lapper since his sensational PR at last year's Swarthmore Invite, and the outdoor opener for 3k club-record holder Mike Franklin. Jerry adds that "Mike is starting with a low key meet before he steps up the level of competition in the coming weeks. After setting the club record in the 3000 indoors, he's going to have a great shot at the 5000 and 10,000 records in the coming weeks." Not to be forgotten is the weekend's road action down in old Virginy. Coming off of his PR at the National Half, Charlie B is excited to better his 10k-best on the familiar streets of Richmond. At the GRC-favorite Van Matre Five Miler, LDO and Outlaw will take on the unforgiving course as another early test of road fitness as they gear up for the spring season. Keep it locked to WGRC for up-to-the-minute(well probably hour) updates on the weekend's running exploits. Play Ball and Send 'Em. I'm meeting Texas Paul and Karl at Manassas tomorrow at 9:15am for some easy miles on trails. I'll likely run 15-16. Karl will be closer to 8. Come one, come all.